THE WEALTH CREATOR'S PLAYBOOK, John Christianson - Joelle Delbourgo Associates, Inc. 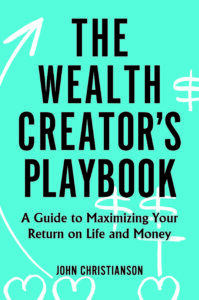 In THE WEALTH CREATOR’S PLAYBOOK: Maximizing Your Return of Life and Money (Praeger, March 2019) an adviser to many of today’s most successful wealth creators explains how to align your values with your wealth, including the ways in which it is earned, managed, and spent, to maximize both wealth and personal fulfillment. About the Author: John Christianson is founder and CEO of Highland Private Wealth Management, a boutique financial life management company in Bellevue, Washington.